Research and practical experience show how technology from Wirtgen China is benefiting the environment by conserving energy and reducing carbon dioxide emissions, whilst making savings in costs and time. Beijing, China (July 16, 2010) /ChinaNewswire.com/ — Research in Hangzhou, Zhejiang province, has shown that the application of foamed bitumen cold recycling technology using equipment supplied by Germany-headquartered Wirtgen China can make major savings in heating energy, reduce carbon emissions, and provide a very high utility ratio for recycled materials. Laboratory tests and practical experience of outdoor paving on trial road sections led the Hangzhou Highway Administrative Bureau to apply foamed bitumen cold recycling technology to overhaul projects on 32 national and provincial roads. Statistics from the bureau show that on 249 kilometers of road 480,000 tons of bitumen wastes had been recycled with a 90% utility ratio. Compared to conventional hot bitumen technology the construction period was reduced by 20%; the heating energy required was reduced by 60%; and carbon emissions were reduced by 80%. Commenting on the statistics from the Hangzhou Highway Administrative Bureau experts from the Emission Reduction Department of China's Ministry of Communications upheld the results. The experts stated that foamed bitumen cold recycling technology will make full use of old materials, reduce energy consumption, reduce carbon dioxide emissions, improve pavement performance and shorten the construction period. They added that practical experience shows that foamed bitumen cold recycling is a mature technology, with good pavement performance, giving energy savings and lower costs. 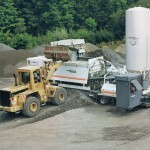 The experts went on to recommend that foamed asphalt cold recycling technology can be applied to highways, first grade roads, second grade roads and other grades of road overhaul and maintenance projects. The expert's report concluded that the foamed bitumen cold recycling design and construction technical specification drawn up by Zhejiang province (DB33 / T 715-2008) can serve as a reference standard for the promotion of foamed bitumen cold recycling technology in China's national transportation industry. The Wirtgen Group is an internationally operating group of companies in the construction machinery sector incorporating four traditional brands: Wirtgen, Vogele, Hamm, and Kleemann. As a technological leader, they offer their customers mobile machine solutions for road construction and road rehabilitation, as well as for mining and processing minerals. The Wirtgen Group has been present in China for more than 20 years and, since 2004, has operated an assembly factory in Langfang, Hebei Province. With more than nine branches and 200 employees, Wirtgen China are always close to their customers.